We’ve had a whole winter at home in Scotland. Regular readers of this blog will know that we planned this after two winters touring southern Europe. I remember saying some silly things like, “Being in the south all the time is lovely but I do miss the different seasons.” Clearly I was deluded. It’s been very special spending time with family and friends and we’ve enjoyed being cosy in our lovely apartment but the truth is that we are hankering for the travelling life again. A year ago, after a nine month trip in the motorhome, I honestly wondered if we were tiring of the touring lifestyle and even thought that we might give it up for more sedate activities like going to stay in hotels for a couple of weeks. This just goes to prove that we should not take too much notice of our thoughts. They pass like clouds in the sky only to be replaced by other more sensible or appealing versions. Before long we found that our love of motorhoming was fully functioning once more. Life at home is pleasant, we have lots to do, great friends and neighbours and we live in a beautiful place but the travelling bug is alive and well and by February we were all itchy footed, finding ourselves reading our own blog posts and giggling, ignoring the advice never to laugh at your own jokes. We had planned a short, eight-week tour of France and Northern Spain in February and March but it had to be cancelled because of a brief health scare for Shirley. It turned out that she is absolutely fine but we needed to stay at home for hospital tests that were scheduled right in the middle of our eight-week window of opportunity. In the end we settled for two short breaks, not too far from home. The first was in February to Beecraigs Country Park in Linlithgow, a lovely little town in West Lothian and a favourite of ours for the excellent campsite and its long walks in the forest, access to both Edinburgh and the coast and the proximity of West Lothian’s wonderful sporting facilities. We love to play badminton and there are several council badminton courts in sports centres not far from Beecraigs. We spent four days there, walking the dogs in howling gales, bringing them back covered in mud, eating too many scones and playing badminton every morning. Everyone tells us that this has been a mild winter. Sadly we’ve been spoiled by the gentle warmth of Portugal in winter and we were cold a lot of the time. This week we ventured off again to East Lothian and a Haven Holiday park where tourers can enjoy a few days for a bargain price. Seton Sands, a place that at one time I could not imagine myself ever visiting, turns out to be a truly excellent choice at this quiet time of year. Facilities are outstanding, pitches huge, fully serviced and completely level. There’s a bar-restaurant, swimming pool, golf course, walking and running tracks, pool tables and a view of the sea. In March, mid-week, you can have a pitch for £13 a night including electricity, your own water and waste point and even a TV connection. Getting settled onto our pitch we attached the hose and filled our fresh water tank, connected to the electric, swivelled our front seats and settled down for a few days. All was going well until the next morning when we discovered that we were sitting in a puddle of water. Holly the motorhome has sprung another leak from her water systems. Paddling about hopefully we peered underneath to try to discover the source of the leak but of course it was hopeless. Water just tracks along any likely route and appeared to be dripping from several places. It is dry inside though, the underbed storage is warm with no signs of damp patches, so we’re certain the leak is from an outside pipe, probably caused by freezing on the only few truly cold days we’ve had this winter. We spoke to the wardens, apologised for our puddle and assured them it was fresh water. They very kindly told us not to worry and we set about spending three days using the site facilities instead of our own. Fortunately here it is no hardship with everything we could need to hand. A nice man from a nearby caravan popped by to see if he could help but could only sympathise with our plight. He had a similar problem with his pump … oh dear. All pumps in this van are working fine, some more noisily than others. We played golf this morning on the 9 hole course on the site. The wind whipped around us as we looked out over the Firth of Forth but it was fine and sunny and we were grateful to feel a little warmth in the air. We brought our pencil bags with five clubs each in the hope that the weather would be kind enough to allow us to have a game. We were delighted to find that we could play well enough to have fun, even though the ball could often be seen to stop in mid air and turn sharp right when it met the teeth of the wind coming in from the sea. My lack of skill at golf is near legendary and I think there should be a special Open Championship for the likes of me where I can show off my amazing ability to overshoot the green by about fifty yards and land in the deep rough, lose my ball, find it again and then wallop it back to the place I started from. Another more sophisticated shot involves hitting the ball with the heel of the club and sending it careering over my head, behind me and then to the left. This one I save for special occasions and is useful for disabling my opponent, causing her to dive for cover into the nearest bunker. The afternoons have been spent in the bar playing pool and drinking soda water and lime – we really know how to party. The two pool tables are good quality and in great condition but they have been placed too close to one another and on several occasions we have found ourselves accidentally bumping bottoms with total strangers. Some people might enjoy that … us not so much. Home again now we are planning some trips around Scotland when the weather bucks its ideas up. 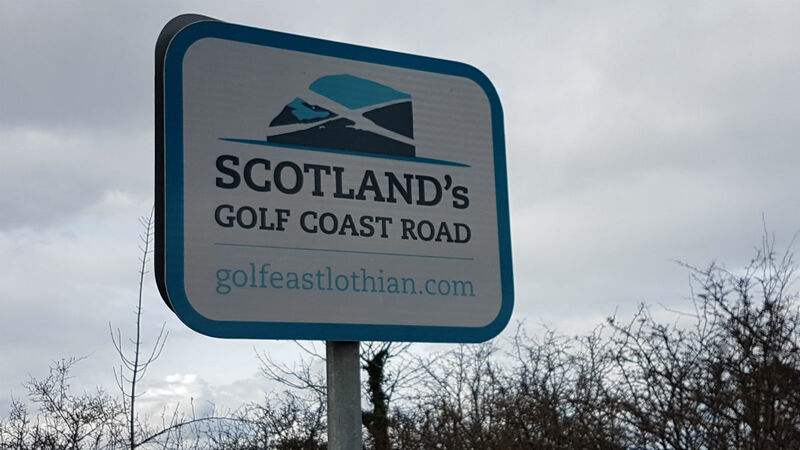 There are some places we have a special affection for, not least Silver Sands at Arisaig and Sango Sands at Durness.We plan to revisit them for a long relaxing break and enjoy the golf at Traigh golf course and the chocolate at Cocoa Mountain. In the meantime we look back with a pang at what we were doing this time last year and make plans to return to Europe in September when hopefully we will know for sure whether we can still meander around for months at a time or whether we will need a visa. Dryburgh Abbey – close to home. How super to have an update from you on this cold, wet, dismal afternoon. I’ve been wondering what plans you might have made for Europe, but I guess until all this political malarky is sorted out none of us know what the heck is going on. Great to get an update, it has been a while! My wife (Lynda) and I live full time in our motorhome and have had a quiet Winter, not really through choice though. At the end of April we are getting the train to France for a month – looking forward to that. Remembering Linlithgow fondly! If you need another mini-trip, try Philadelphia between June 1 and Aug. 3. Would love to see you. So lovely to see your blog again and very glad to hear Shirley is ok. Your final comments ring true with us too as we feel we can’t plan too much for next winter until we see how the land lies. We hear Portugal has been wonderful this winter, we got rained out last year in Albufeira and left for Spain. This year we have spent January to the present day in Spain and we had 81 days unbroken sunshine until last week. We’ve had some rain but do you know I didn’t mind a bit! We didn’t leave Blighty until 28 December as we had Christmas with our very grown up kids and we were feeling the cold before we left. Can’t do winters at home now too used to warmer climes, we look forward to hearing more from you on the blog as the year progresses. Thanks! Here’s to some great tours in 2019! Ahhhh lovely to read your update, we thought we spotted you at Beecraigs! We were based there when our newest grandchild, a girl, was born on 21st February and we received the call to pick up our 3yr old grandson so baby could be delivered at home. Beecraigs has great child playparks and bug hunting opportunities and is only 15 minutes away from our daughter’s. So pleased to read that all is well too. Best wishes.